The west section of Beltway 8 / Sam Houston Tollway was the first tollway section to be contructed, with the first segment opening in 1988. 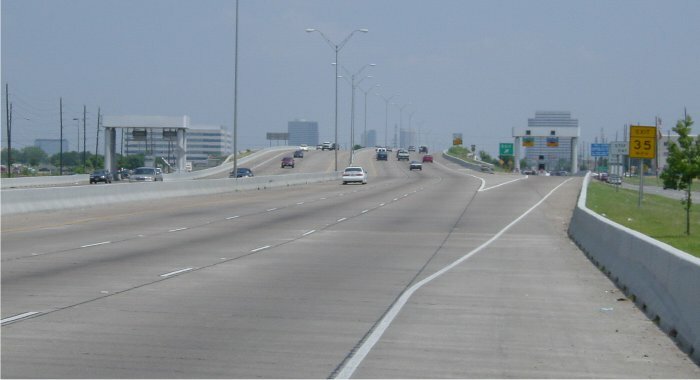 This section of the Sam Houston Tollway has 6 main lanes and 6 (free) feeder lanes for most of its length, except for a section south of IH-10 where there are 8 main lanes. 1952 City of Houston planning documents identify the need for an outer loop. 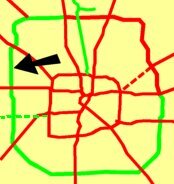 Late 1950's The beltway is added to Houston's official freeway plan as a full freeway. 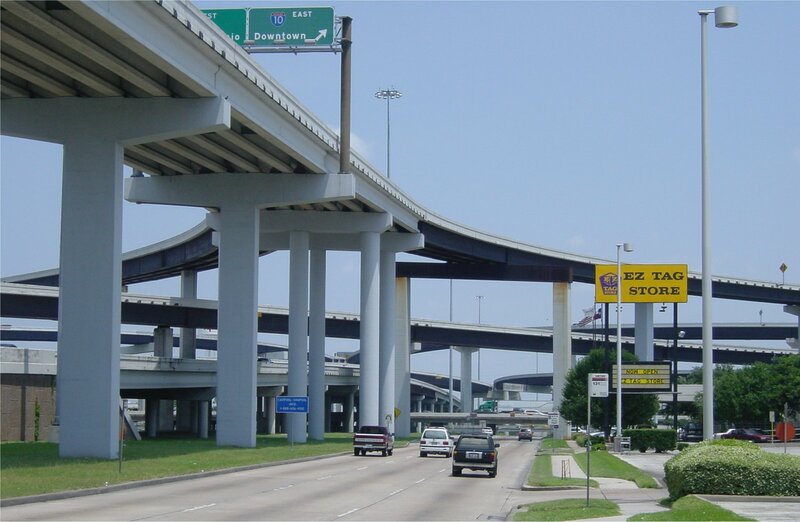 The western section of Beltway 8 is constructed exactly where shown in the 1950's document, except near the intersection with US 290 where the tollway veers to the east to miss the community of Jersey Village. 1960's A short section of Beltway 8 is constructed from IH-10 to Westheimer. 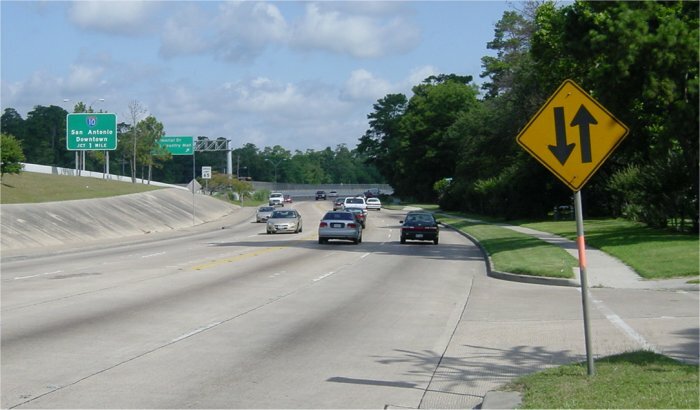 Most of the roadway was a two-lane road with a continuous center turning lane. North of Westheimer to Buffalo Bayou, a 400-foot-wide right-of-way was set aside. Early to mid 1980's Six-lane feeder roads are constructed for most of this section. 1988 The first section of tollway between IH-10 west and US-59 south is opened. 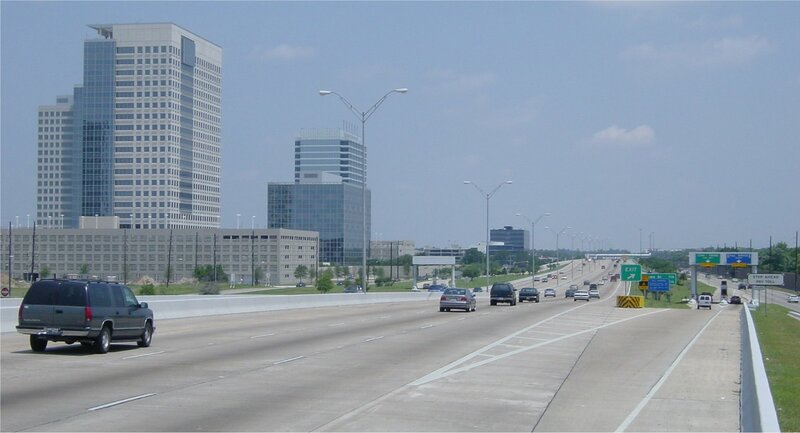 1989 The section of tollway between IH-10 west and US-290 is opened. 2003-2005? The tollway will be widened to 8 main lanes for most of this segment. 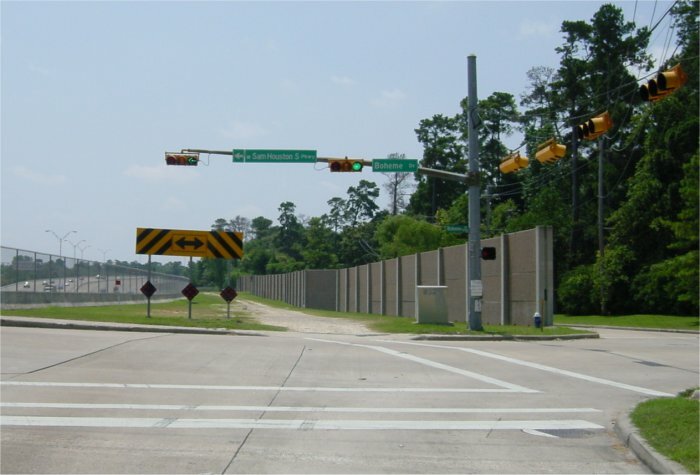 The section between IH-10 and US-290 will be widened first. Photos start from the south end and proceed northward. (high resolution 104k) Looking north at the Bellaire overpass. This is a typical section of roadway south of Westpark. 20-May-2001. Looking north from Harwin Drive. The Westpark Tollway will cross where the railroad bridge now exists. Summer 2000. 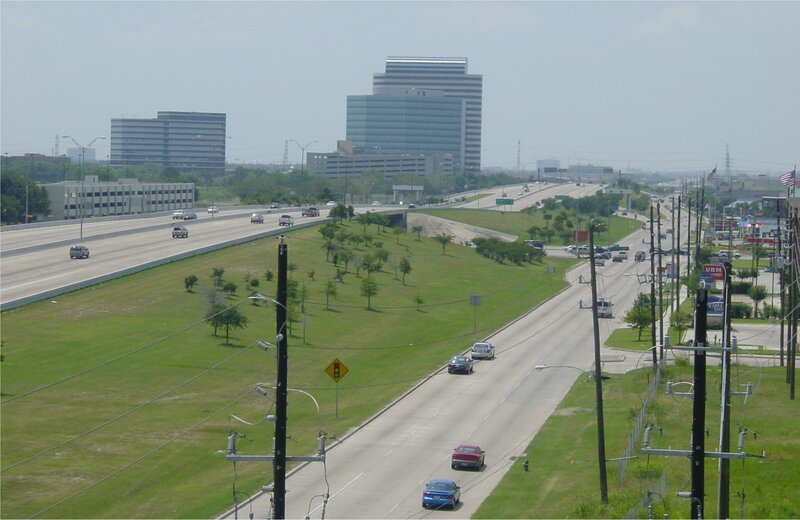 (high resolution 165k) Looking north from the Westheimer overpass. Most of the office buildings on the left have recently been constructed. 20-May-2001. (high resolution 218k) Looking south over the Westheimer overpass. 20-May-2001. (high resolution 155k) Looking north-northeast over the Briar Forest overpass. The main toll plaza can be seen in the background. 20-May-2001. (high resolution 217k) Looking north from south of Memorial. The freeway is in a trench through this area. 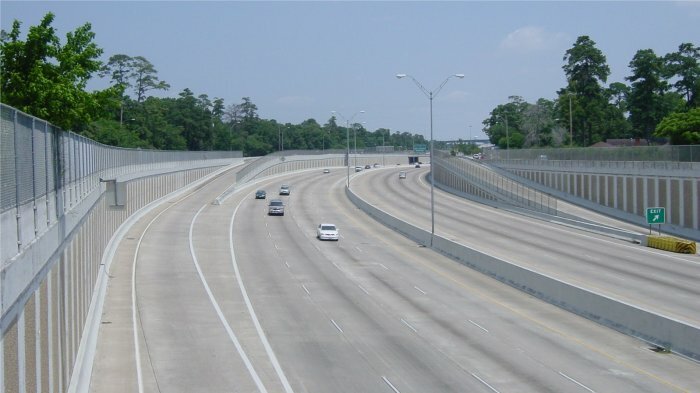 This is the only sustained depressed section of the Sam Houston Tollway. 20-May-2001. (high resolution 124k) Beltway 8 features a two-way feeder at the Buffalo Bayou crossing (just south of Memorial). This is highly unusual, and probably the only urban feeder road in Texas that is 2-way. I don't know why this was done. I always assumed it was an inconvenience designed to encourage motorists to use the tollway. Cost and neighborhood impacts probably also played a role. In the long run, look for normal one-way feeder roads on this section. 24-May-2001. (high resolution 152k) This shows the southbound feeder road being diverted to the east side of the roadway to join the 2-way feeder on the east side of the corridor. 20-May-2001. Looking north from just south of IH-10. Summer 2000. (high resolution 229k) Looking north along the northbound BW8 with the stack ramps towering over the roadway. This stack will be demolished and reconstructed in the massive IH-10 expansion. 20-May-2001. (high resolution 107k) Looking north on the Clay Road Overpass. This is a typical section of the tollway between IH-10 and US 290. This section of tollway is not particularly interesting. The corridor was largely vacant land until recently, but a lot of development, including the office tower under construction in this photo, is now taking place. 20-May-2001.